A hardworking truck demands a strong engine. 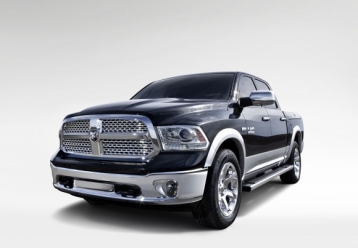 With the 2013 Ram Pickup you get a few different options. Although this truck is available in 1500, 2500, and 3500 models, this review will focus on the 1500. Standard on SLT is a 3.6-liter V6 paired to an eight-speed automatic to produce 305 horsepower and 269 pound-feet of torque. It is available in two-and-four-wheel drive and returns 17 mpg in the city and 25 mpg on the highway, which might be a little better than you would expect from a full-size truck. The 2WD Quad Cab model can hit 60 mph in a brisk 7.8 seconds. There are also two V8 engines available. The 4.7-liter V8 produces 310 horsepower and 330 pound-feet of torque. For even more power, opt for the 5.7-liter V8 that generates 395 horsepower and 407 pound-feet of torque. Fuel economy for this big engine is poor at 14 mpg in the city and 20 mpg on the highway, but it is to be expected. This larger V8 can also tow 10,450 pounds. Even the base V6 can handle 6,500 pounds, which is impressive. Driving is delightful whether you are traversing rough country roads or cruising down the highway. Ram 1500 does not ride like a truck, so it is definitely a suitable pick for a long commute. If you opt for the available air suspension, you will appreciate that the two-inch drop allows you to get in with ease. •	Audio - There are a variety of audio systems available. The base six-speaker system includes iPod and auxiliary inputs. The top-of-the-line system comes with an 8.4-inch display, subwoofer, satellite radio, and more. •	Uconnect® - This access system turns your center stack into either an entertainment center or a mobile office. It features an 8.4-inch touchscreen, voice command, Bluetooth, and steering wheel controls. •	Navigation - The available navigation system features real-time traffic, movie information, turn-by-turn directions, and more. It has never been easier to find your way to your destination. Ram 1500 can be as plain and simple or as extravagant as you want it to be. It is available in a multitude of body styles so there is something for everyone. You can choose Regular, Crew, or Quad Cab, two different bed lengths, and six main trim levels. So, whether you need a basic, regular cab work truck with an eight-foot bed, or if you want an everyday vehicle you can valet at your favorite five-star restaurant, there is a 1500 for you. The top-of-the-line trim is Laramie Limited, which includes a mesh grille net, chrome side step bars, spray-in bed liner, and monotone paint. Like the exterior, there is a ton of customization available with the interior too. For example, the Tradesman is designed for work with a 40/20/40-split bench seat in the front, folding rear bench seat in the extended cab, and easy to clean vinyl upholstery. Jumping back up to that Laramie Limited trim previously mentioned gives you leather upholstery, heated seats, and steering wheel, wood grain interior trim, and plenty of luxurious detail. If you opt for an extended cab, you can always put some cargo in the backseat. However, most will haul their belongings in the bed. The 2013 1500 comes with either an eight-foot or six-foot-four-inch cargo bed.